"This is a quick and easy recipe that is sure to impress guests. It's not your ordinary spinach salad." Mix vinegar, sugar, water, butter, and salt together in a saucepan; bring to a boil. Cook and stir until sugar dissolves and mixture is bubbling, about 1 minute. Remove from heat and cool to room temperature, about 1 hour. Whisk egg into dressing; return saucepan to low heat and simmer until dressing thickens, 5 to 10 minutes. 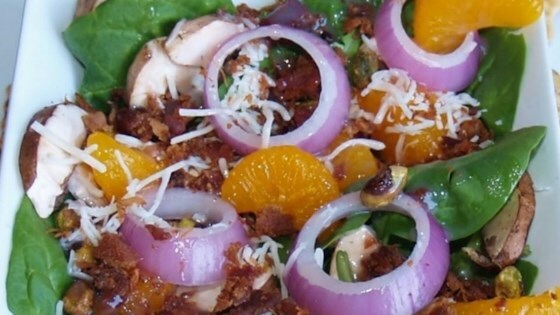 Combine spinach, mushrooms, mandarin oranges, almonds, bacon, red onion rings, and croutons in a large bowl; pour dressing over salad. Toss to coat. Just made this for the second time in 2 weeks. Fabulous! Didn't change a thing. Didn't add croutons though. This recipe is very easy & delicious. I may substitute another sweetener for some of the sugar next time I make it; or I may decrease the amount of sugar by 1/3. Very good salad. The dressing was good, but I think the salad would be just as good with a bottled poppyseed dressing. I used cashews instead of almonds and opted not to use the croutons. No changes to the recipe and it was delicious; will do it again! Lots of compliments about the salad. I shared the recipe with my guests that tried it. Very easy to make. I have made something very close to this before, however the dressing was excellent! Many compliments on it!